Last year the Flood Mitigation project financed by the Inter-American Development Bank (IDB) completed its work in the Belama area of Belize City. 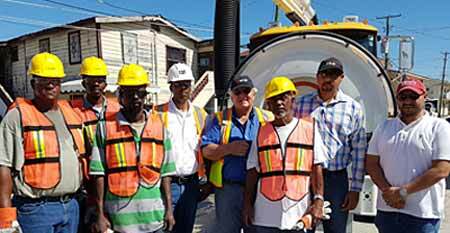 As part of the project a number of heavy duty equipment was handed over to the Belize City Council in order for the council to better service the covered drains that were placed as a result of the project. Included in the donation was a backhoe, a street sweeper, a tar truck and a vacuum truck. While the backhoe and the tar truck has already been put to use, because of the technology of the street sweeper and the vacuum truck there was some training that was necessary. Since the handing over, training has taken place for the sweeper and that piece of equipment will shortly be put to use. Now it is time for the vacuum truck to be put to use. As a result, this week extensive training both in theory and practical terms took place to have members of the newly established flood mitigation unit within the council learn how to use the million dollar truck. The truck will go into full operation next week and as it does it will be complemented with a maintenance schedule where the council will maintain close communication with the company that supplied it, being Gentrac, as well as the manufacturer in the U.S.